My name is Jami DeLoe and I am a recovering alcoholic. I have found that the only way I can stay sober is by the grace of God, so I thought that I would try my hand blogging about some of my thoughts, experiences and challenges in sobriety. A little bit about me: I am 41 years old, married to my best friend (he’s also in recovery) and I live in Tucson, Arizona. Like many alcoholics and addicts I have a dual diagnosis. I suffer from chronic depression and post traumatic stress disorder in addition to my alcoholism. Over the last couple of years, I have been to treatment for addiction twice, spent time in the psych ward, and sufferred lots of negative consequences due to my drinking. There isn’t much that people could share with me about themselves that would shock me anymore. There’s no doubt that I have done or said or thought the same thing myself. What I have learned is that recovery, for me, only works when I recognize and accept God’s grace. I know that I can’t do it alone, I tried that for many years unsuccessfully. But thankfully, with God’s help, I am able to clean up the wreckage of my past and live a new life. Thank you for looking at my blog. I hope that something I have written will make a difference…maybe bring a little bit of grace to your life. Hi Jami! I nominated you for the Liebster Award! You can see the post at http://wp.me/p2AkqH-9m. Love your writing and what you’re doing with your blog. 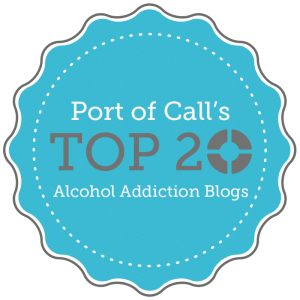 I have added your blog to my blogroll at Last 100 Days Alcoholic. It would be really appreciated if you could contribute an original piece on your own alcoholic story to Alcoholic Life. Good luck on your recovery and I wish you much strength in your journey! I came across your article on Healthyplace.com and really enjoyed it. My company Kool Living Recovery is in the market for talented writers like yourself – do you freelance at all? If so, I’d love to work with you! Thank you so much for your message. I do currently do some freelancing, and I would love to hear more about your company, and the possibility of working with you! My email address is: jamideloe@gmail.com Can you give me some details?